Does your jewelry box look like this? All jumbled and cluttered? Some things broken, most things bought on impulse? Or because they were ‘just the thing’ according to that sweet girl in the store? I want you to think carefully- how much of that jewelry do you actually wear? Recently I came across the concept of a Capsule Wardrobe. The basic idea being that everything in your closet goes together, fits pefectly, is good quality, suits your lifestyle perfectly, and is something that you absolutely love. Nothing that you haven’t worn in three years. Nothing that you would wear if only it was a slightly different shade. Only excellent pieces you love. I thought this was brilliant, and the advice about investing in good quality is something I’m taking to heart! So as I go through my closet, turning it into my vision of a capsule wardrobe, it occurred to me that people should do the same with their jewelry. Fine jewelry is often an investment. Precious metals and fine gemstones aren’t going to be the same impulse purchase as the imported silver plated enamel bib necklace that the shop girl wants you to buy. But who wants silver plate that goes into and out of style in a blink? This is where investing in stunningly beautiful quality jewelry is essential. 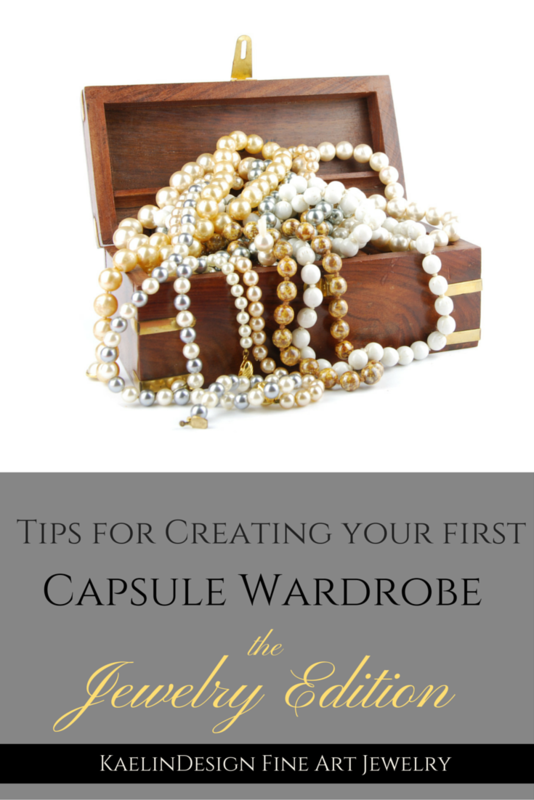 And because I’ve found visual infographics helpful in understanding the capsule wardrobe concept- I made one for you for jewelry! Here’s how it works. Empty your jewelry box onto an empty surface. Select one piece, and follow the flow of the infographic to sort your jewelry into three piles- Keep, Fix, and Gift/Donate/Sell. Each piece in the keep pile should be something that means the world to you and makes you feel amazing. Note that I did not say that each piece must be made from solid precious metals, and encrusted with diamonds. This is not about having only having jewelry that is “fine” jewelry, this is about you owning pieces that make you happy, and mean something to you. The silver plated ring that has cracked rhinestones, that your husband gave you from his crackerjack box when you were both 15? If it makes you happy- it belongs in your jewelry box. But that bib necklace that still has the price tag on it- from last year!- should definitely find a new home. Pieces that are broken can mostly be repaired- if you really love them. I personally repair rhinestone plated jewelry for my daughters- using epoxy and ‘silver’ paint- because they love their costume jewelry. But I wouldn’t pay someone else to fix them. You just have to weigh the costs. You may truly have loved that plated brass bracelet you picked up in a flea market in college, but is it worth $50 or $100 to repair it? And if you did repair it- would you wear it often? Does it suit who you are now? The same can be said for precious metal jewelry. Let’s think about that sterling silver and topaz tennis bracelet your brother gave you for Christmas twelve years ago. If you wore it because you love your brother, not because you love the bracelet, perhaps your niece would like it. Or perhaps your favorite local jeweler would be willing to refashion it into a different piece that you would wear on a regular basis. Take each piece one by one, and really think about how it fits into your lifestyle. Don’t feel bad if you realize that the overly expensive cocktail ring you bought is something you really hate wearing. The nice thing about precious metal jewelry is that it can be sold, even years later, and you can recoup some of your cost. Just as a note however- please do not visit one of those “Cash 4 Gold” places. The people running those are making a very nice profit indeed- please visit your favorite local jeweler instead. 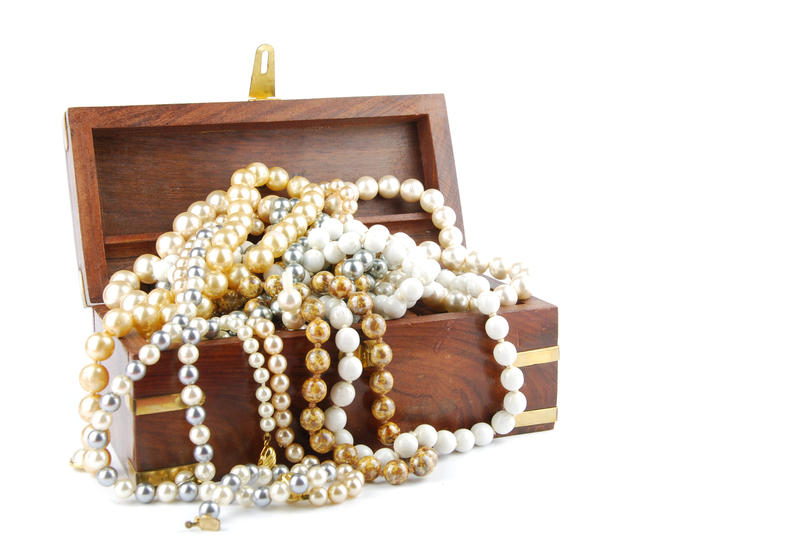 Good jewelers are always on the lookout to reclaim and recycle gems and metals, as a value-added courtesy service to our customers. Now that you’ve gone through this- I expect your jewelry box is fairly empty! So next time I’ll be writing about how to choose new jewelry that suits you perfectly. How to avoid the traps of trendiness, and choose timeless pieces that will last a lifetime- complete with a printable checklist! I love this idea! A capsule wardrobe for jewelry is so needed – for me anyway. When I get to the point where I can’t find the earrings I want to wear because I’m digging through all the earrings I DON’T wear anymore, it’s time to sort them out so I’m only going through the ones I actually wear.